It goes without saying that the United States censuses, taken every 10 years, are among the most valuable genealogical records that can be found for those of us who call some corner of this country home. 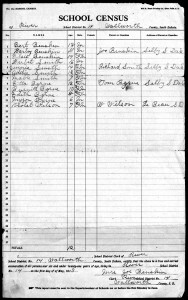 The population schedules, slave schedules, agricultural and mortality schedules — they all go such a long way towards helping us find and trace our families throughout this country’s history. And gaps in the federal census reports are often delightfully filled in by state censuses, frequently enumerated in years when the federal census was not taken, such as the Alabama State Censuses of 1855 and 1866, the California State Census of 1852, the Minnesota State Censuses of 1865, 1875, 1885, 1895 and 1905; and the Wisconsin State Censuses of 1855, 1865, 1875, 1885, 1895 and 1905, just to name a few. But those population schedules? They’re not all the censuses that are out there. State laws often required different kinds of enumerations for different reasons. Case in point: the South Dakota school census. 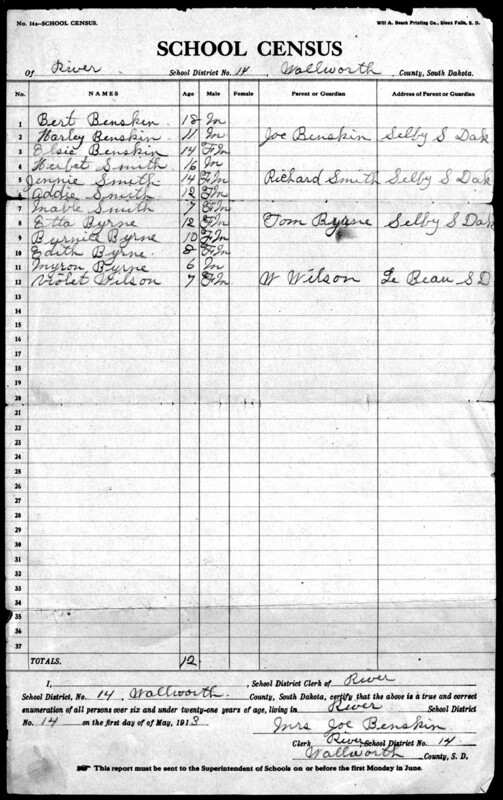 Some of these school census records are available online at FamilySearch, and they tell stories that just can’t be told quite the same way through any other records. This kind of detail, on a neighborhood-by-neighborhood, year-by-year basis, is awfully hard to come by … and wonderful when it exists. All thanks to one single statute. And a search of the Family History Library catalog using the key words “school census” returned 1275 entries. Not all of them are actually school census records… but there are enough — the first, oh, 200 or 300 records — to keep us all working and smiling for an awfully long time to come. Let’s see here… School census, 1894-1899, 1903-1905 Metcalfe County (Kentucky). School census records, 1950-1984 Taylor County (Iowa). Texas, Matagorda County, Scholastic census records, 1923-1946. Scholastic census and annual reports, 1883-1925 Harvey County (Kansas). North Dakota also had school censuses (1905-1941). Nice. Oh wow! This is wonderful information! I wasn’t aware of these school census records. Thanks so much! Kentucky also had school censuses in the 1890’s and early 1900’s. I have found them for several counties I have worked on, but don’t know if they exist for all counties. Good to know, Sharon, thanks!! Mississippi calls this listing “Educable Children.” Not all years are available for all counties. The Mississippi Department of Archives and History has most of these records. They can be accessed at the Archives; some of them are on the Archives web site. FamilySearch.org has also placed some of them on their web site. They have been very useful for persons who may not have a birth certificate. And, of course, the ones I need in Mississippi are among the missing, darn it. Great info, thanks. Most all of these are buried in the Vivian Cemetery. That’s wonderful to know that your family is in those records, Denise! Your grandmother’s name is clearly recorded as “Lullu” in the census that’s likely from 1914. In the 1915 census, it looks to me like the last letter was written as an A, but I could certainly be wrong about that. In any case, there’s plenty of evidence that these folks are your kin, and that’s terrific! re: my 2 times great Grandma. It seems I have kinfolk who could not spell right. Well nice meeting you. Glad I found this site. I am about sick of FamilySearch. and Find a Grave. Spelling sure wasn’t the strong point in the past (and won’t be in the future with our kids all using texting shortcuts!). Glad you found your relatives’ records anyway. They all made it over from Lanark, Carroll Co. Illinois. Herb and Jenny were born in Illinois. My Mom and grandma both write family historys plus I heard this as a kid. That’s great stuff, Denise. My great Uncle John Cottrell was a Trail City resident for most of his adult life. His children Mattie and Philip went to school in Walworth. That is pretty cool Judy. On my Dad’s side some of his nephew’s kid live around Walworth so probably went to school there. Question: Besides South Dakota and Kentucky have school Census records, what others states did? I am most interested in Iowa Illinois and Wisconsin ones. How these were taken, when and what form varied greatly from state to state. I know that in Iowa, there was a school census as part of the 1895 state census, for example. Checking with the archives of each state should give you a good overview of what your specific states did, when, and where the records might be today.